Producing a show is no easy task! And producing a new concept on a new landscape is certainly not as easy as 1-2-3! So it is always heart-warming when there are those who are willing to step up and extend a warm and generous hand with their kind support! As we count down the days to our show, on June 23rd, I would like to take this moment to say a heart-felt ”thank you!” to our current sponsors, with whose kind assistance, we will produce an extraordinary show! Taking the first place with a generous donation of 1 all-inclusive travel tour ticket, and a 3-night hotel voucher, a combined value of 10,000RMB value, is Crown International Travel Group of India. Thank you, Iqbal Hassan, for this munificent donation. The 5-Night All-inclusive Tour Package to India, will be awarded to the BEST AUDIENCE CHALLENGER of the night, and the 3-Night 5-star Hotel Voucher for India will be given to the lucky ticket number from a drawing of the first 24 tickets purchased. Our faithful supporter, Malek Monser at 1001 Nights Restaurant, has been an invaluable sponsor from the inception, and continues to be both gracious and generous with providing not only a swanky venue, but also allowing us exclusive accommodation, and providing exceptional catering service! Malek will be providing us the exquisite dining menu of Middle Eastern cuisine, which will include the renown hummus and pita bread, lamb (or beef), fatoush salad, and the delectable array of Turkish and Middle Eastern desserts. Thank you, Malek! Jensen Moreno Fine Arts, has recently joined our supporting team, and has already been most accommodating in sharing her art exhibition space, and her tour time for the promotion of our show. With the added contribution of her daughter’s participation in the show, we are most grateful for the opportunity to collaborate in this venture. And a fashion design/ wardrobing gift certificate valued at 500RMB, which can be used for clothing design, costuming, wardrobing, or alterations services. Eduport International, an international education consultation company, has donated towards the cost of promotion, printing and publishing of all media. And still there are more sponsors to come! So stay tuned as we update you with all the prizes, performers, and previews of what the big day is about. 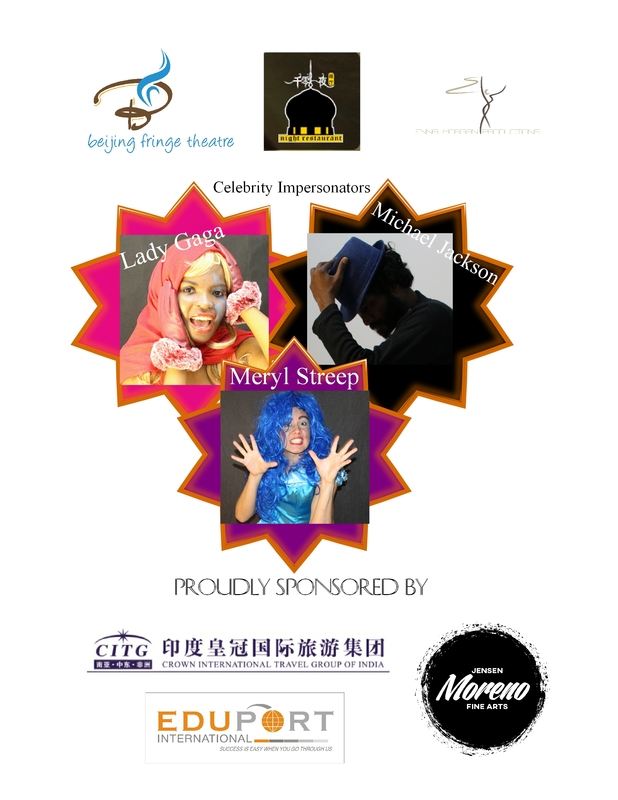 Thanks again to all our sponsors, and to all our performers for their hard work and dedication to the performing arts! ← Previous Previous post: So You Think You Can Act! !